Carl Wark is located close to the defensive dyke of Roman Rig, Sheffield, which has been postulated as being the line of Venutius’ south eastern border with Roman Britain, AD 69. From Sheffield, to the west, Carl Warks location makes it ideally placed to extend this border line into the Peaks and towards Mam Tor. If one looks at a line drawn from the Roman fort of Templeborough, and that at Brough on Noe, Carl Wark appears to occupy a significant position, if it were occupied by peoples defending a border from the Roman threat. The conjecture that this may have been a pre-existing fort, possibly abandoned, which was used by Venutius to house his border patrols in the immediate run up to the Roman invasion makes this site of prime interest to anyone interested in the history of the Brigantes. At this point in time, no dating evidence of any sort has been found at Carl Wark. The last excavation took place in 1950 and was simply a cut through the rampart. For the time being, the strength of it’s use by Venutius must be credited by it’s relationship to the surrounding archaeology. From Sheffield follow the A625 towards Bakewell. At Stony Ridge this turns into the A6187 towards Hathersage. Follow this for approximately one mile then take the next right turn towards Ringinglow. 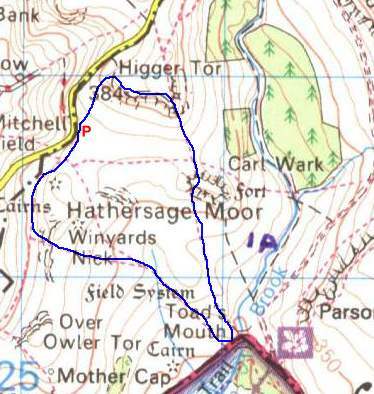 If you miss it, don’t worry – a large pub car park just in Hathersage (1/2 mile on) is a good place to turn. Just under a mile along this road on the right a footpath marker by a gate marks the first possible parking spot, right by the footpath sign. If this is missed, follow the road a little further (1/4 mile) to another footpath marker on the right where there is a larger area for parking along the roadside. Both footpaths can be used to access the fort. This is a good time to explain the main features of Carl Wark hill fort. Carl Wark is an escarpment hill fort which uses the very steep natural cliffs to give the fort around 90% of its defenses. To give a feel for dimension, the man made wall seen to the right on the above picture is 3m in height, which means the sheer cliffs rise from a height of 15m to about 25m and in most places is surrounded by a very steep bank. Across the shallow neck of the plateau a heavy stone wall has been constructed, much of which can be seen from the photo above. However this wall is actually ‘L-shaped’ and bends around the far side of the fort to form its only entrance (although a possible smaller entrance may exist about half way along the northeastern wall). The natural structure of the rock – although sheer – has in places many cracks to serve as handholds and can be fairly easy to climb; it is likely that additional fill and walling will have been required at several points in order to make it the stronghold it was obviously designed to be. The rocky interior is unlikely to have been the main living location for the fort’s occupants – the main village is possibly located somewhere to the south of the main entrance. On this assumption, the fort could have held as many as 200 – 500 defending occupants. The wall is a large bank of turf 8.5 metres wide revetted in front by a wall of large blocks standing 2.5 metres high. From the front it appears that the dry-stone walling is fairly close to its full original height. Note the lack of boulders that have dropped from the top – this is because the wall has tilted back into the turf bank, losing only its top layer, which may be seen in the bank behind. Continuing along the wall to its southern corner you can clearly see the entrance leading down an interesting slope. It would not be surprising if excavation showed a significant amount of ‘spoil’ here from the fort’s periods of occupation. 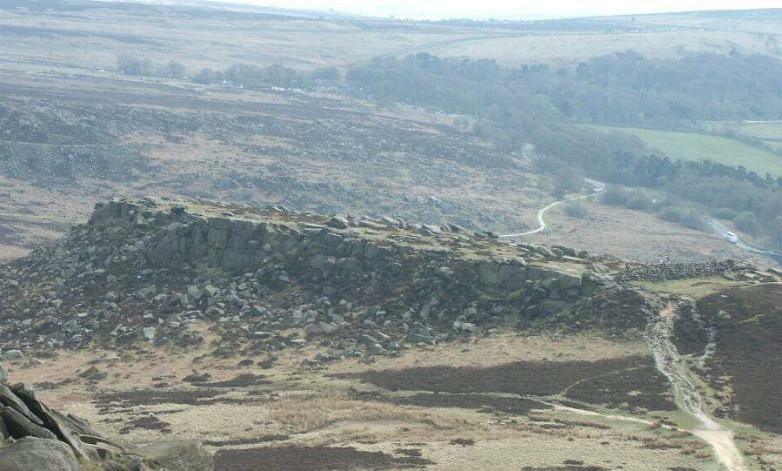 About halfway down the length of the fort on the northern side (looking towards Higger Tor), an old millstone can be seen – evidence of later occupation. 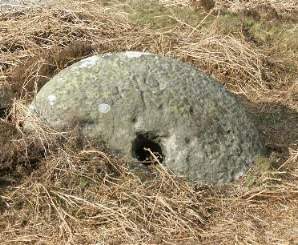 Mill stones like this can be seen throughout the area. Leaving Carl Wark via the southern entrance the footpath continues downhill towards the brook. About half way down the land becomes boggy – make sure your boots are on tight! The path now does a U-turn and heads up towards Winyards Nick, passing some excellent rock formations and an ancient field system. On the day of my visit it had started to rain quite heavily so I had a bit of a mad dash to get back to the car, so I’ll need to go back to view the field system in more detail. At the top of Winyards Nick the path swings right in a more northerly direction. More cairns can be seen very close by. Before too long you will find yourself back at the starting point of the walk – just remember to swing right towards the large rectangular sheep enclosure rather than following the main track back towards Carl Wark, unless you feel the need for another visit! I really can’t recommend this visit highly enough. The site is very atmospheric – within fifty yards of the road you feel like you have gone back in time. “Carl Wark (modern name) is possibly an Iron Age fortification, its first mention is around AD72 during the Brigante uprising (lead by Venutius?). Romans occupied local forts including Higgar Tor, but the fort marker is separated from the Tor by a trackway – so Carl Wark may actually be the fort. The Carl Wark then becomes the ‘Freeman’s Fortification’ of the Bretton enclave (pre 627?). Later the name changes to Ceorls Weorc in the Middle Ages and then Carles Work by the Industrial Revolution.” (From Stainforth G.; 1998; The Peak, Past and Present; published Constable ISBN 0094754209). “The longer lines of defence, such as the Roman Rig, shew, in the opinion of the same investigator, a more advanced state of civilization, and are therefore probably of later date. No long earthwork which has yet been excavated has been found to go back as far as the Neolithic period. The Wansdyke and Bokerley Dyke, which were formerly supposed to be pre-Roman, have been proved by General Pitt-Rivers’ excavations to be post-Roman. The Romans themselves built earthen ramparts of this kind to defend the borders of their provinces…” Ella S. Armitage – A Key to English Antiquities 1897. 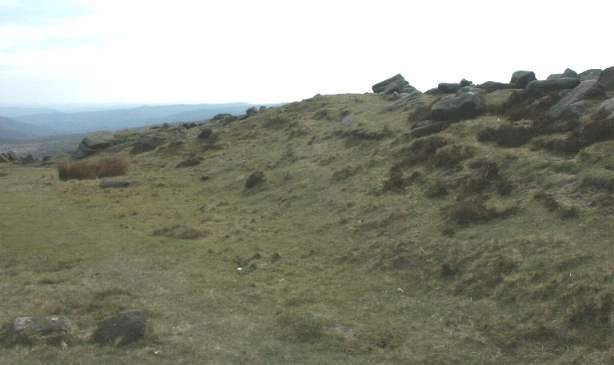 “Higgar Tor, that romantic hill crowned with crags above Hathersage, has long been associated with “Druid Worship,” but there is no authentic support for this. Real History lies just across on Carlwark, which is an ancient British Fortress,and well sited too. The military engineers of past ages selected a rocky platform on the top of a hill about 600 feet long and 200 feet wide, with a vertical drop on three sides. Once the edges of the platform were guarded by a wall of huge stones, which have gradually fallen down the sides and lie around in a tumbled scattered state. On the unprotected side the builders threw up a great rampart of earth about twenty feet thick, faced with mighty stones of natural shape. They knew not the use of mortar so crammed small pebbles in the cavities. This rampart sloped back into the fort to give defenders access to the wall. The only entrance was by a path along the base of the artificial scarp which wound up a narrow walled passage of rude stonework reaching the summit on the south side. Attackers trying to force the gate would come under a hail of missiles from above. One would like to know how the defenders fared in a siege, and who made bold to attack such a stronghold. It is interesting to note that two silver bracelets were unearthed in the vicinity, perhaps the property of some Bronze Age chieftain. From Carlwark we turn to the numerous defense trenches still plainly visible on many hillsides such as on Win Hill. They must have formed part of a very early plan for holding the security of Peakland summits as last strongholds. A deep trench called Grey Dyke showing between Brough and *Bradwell on the hillside of Shatton has attracted much speculation. It has been assigned to the Romans but is more probably Early British.” M. Andrews – Long Ago in Peakland 1948. There may be a stone circle / monument ‘Mother Cap’ to the WSW of the Toads Mouth (0.5 mile), near Over Owler Tor (to South, 1/8th mile). OS map Seventh Series, 111 revised 1949-51 and published 1953. 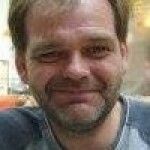 Reference given by Rob W. – TTForum. 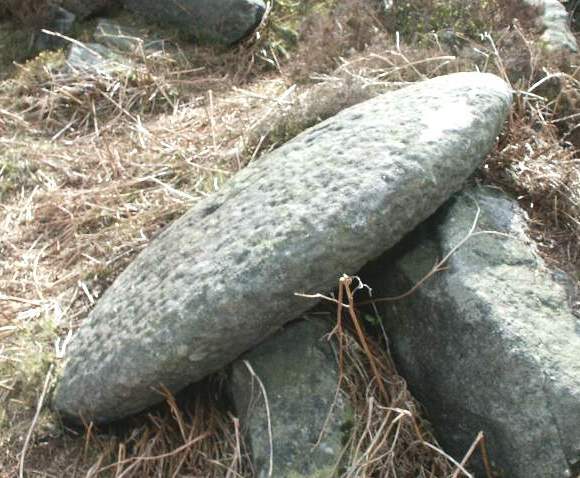 “an enigmatic site at Carl Wark near Hathersage should be noted. This site occupied a two-acre rectangular promontory, surrounded by steep scarps on three sides. 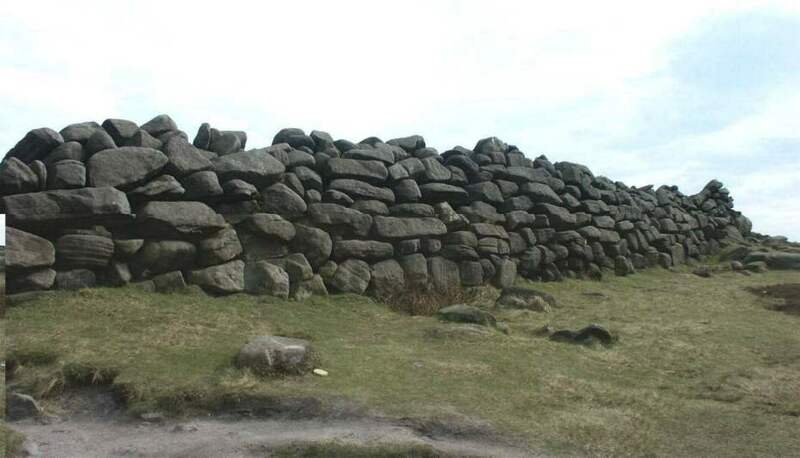 These natural defences are strengthened by walling of large gritstone boulders. 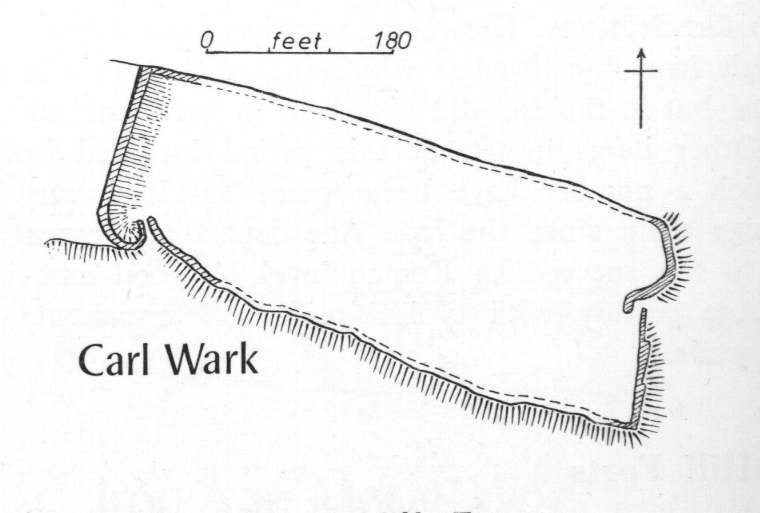 The narrow neck of the promontory, some 150 feet accross, is defended by a massive wall face of large gritstone blocks, 8ft high, backed by and bonded into a strong turf ramp on the inner side (cutting excavated 1950; Piggot, C. M., 1951). To the south of the western end of the turf stone-faced wall, an inturned entrance about 18 feet long is further defended by massive gritstone walling (plans and photographs in Challis, 1969, figs. 7-8, Pls 8-12)… [The author then goes on to compare the construction with that of South Barrule, Isle of Man, which had a carbon date of 523 B.C., and also to Maiden Castle, Bickerton] … … It may be that towards the mid first millennium B.C., when a vertical inner face to a rampart was not necessary, a stone wall backed by a ramp of some locally-occuring commodity was used instead.”. Later Prehistory from the Trent to the Tyne, Challis and Harding, BAR 20, 1975. Burbage Moor (SK250812 – 2911831) T. C. Welsh reports that remains suggesting a road, possibly of Roman construction, have been noted. Lengths with camber and lateral ditches occur between SK25008125 and 25128117 as an incline approaching Winyards Nick from the south west, between SK260811 and 26388135 descending the east slopes of Carl Wark to Burbage Brook, and from SK28107234 to 29078314. Between SK25268115 and 25608110 the camber has been worn and broken by the ruts of later tracks which run alongside to the north; this stretch features about 50m of kerbs. Fragments of camber occur at SK 269814, 17078174 and 27328167. A section with incline terrace, camber and some kerbing occurs on the west side of Houndkirk Moor Road, from SK 27638174 to 27638213, but the kerbed portion is duplicated elsewhere on that road and may be more recent. A possible continuation near Hathersage in Derbyshire (SK 2438130240812) suggests that, if Roman it may link with the length of road from Brough to Shatton.” YAJ Vol 50 1978 P.10. “This is a nearly rectangular enclosure protected on all but the W by natural slopes. It is fortified on the W and S, and perhaps originally all round, by a turf and soil rampart faced on the outside with a masonry wall still 9.5 ft. high on the W. Though leaning inwards now, this facing wall would have been built vertical. There is a fine in-turned entrance at the SW corner. It is 6 yds. long and 5ft, wide at its inner end. There is a simple entrance on the E side. Date, perhaps 1st century BC. but many authorities regards this as a post Roman (Dark Age) in date.” Guide to Prehistoric England, Nicholas Thomas, 1960. This hillfort may have been in a strategic location at the end of the Iron Age, recent archaeological work suggesting a late Iron Age date for the building of Roman Rig between Sheffield and Doncaster indicates that this could well have been the line of the border between “free Brigantia” and the Roman ruled southern Britain. The fact that Roman Rig is a defense shows Venutius to be the most likely builder and if this proves to be the case, Carl Wark is an obvious candidate for a continuation of this devensive line. 1. F.G. Simpson performed an excavation of the site in 1950; this would be interesting to identify the manner of construction for the wall. – Located and update being prepared. 6. G. Stainforth seems to indicate a specific reference to 72AD and a map reference – this should be investigated.